Took a "day trip" to visit with some friends. Took both of them a pair of wrist warmers and some pumpkin muffins. Haven't seen them for a couple of years and figured it was high time we did! Also touched base with two of my girl friends, still have one I need to touch base with. It's raining here, had some thunder etc., but nothing bad. Our garden area will enjoy the moisture seeping down through those wood chips! I've got several skeins of yarn so I'm crocheting wrist warmers to be given away to friends etc. If I have a bag of them I'll never be out of a gift to give! LOL I'm doing them in three sizes so I've got the bases covered :-) Picked up another cheap fleece throw today at WM on our way home, leopard-type print. I want to toy around with making a long skirt. We'll check with our Amish friend south of here and see if his wife (or ???) has a pattern for men's pants. I want to try making some for MrWE2. Lounging around but also shtf. It will be much easier to set back some rolls of fleece throws and yarn than trying to buy and store yardage etc. Also picked up some LED Christmas lights (clear) that were on sale at WM while we were there. They'll be nice to hang around the top of a room for lighting and they won't use hardly any electricity :-) (at the Homestead) place. Still not on top of stamina problems. Just beginning to do bits here and there. Doing dishes in a pot cuz can't use the kitchen drain until it gets fixed ..."next year". Feels like I'm camping but thankful for hot/cold running water. Finished a trilogy in physical book form. so back to reading my ebooks. MtRider ....gonna be REAL COLD here the next few days. Ended up with two days without power. Since we had the generator, neighbors came over and camped out with us. Had a final meal with everyone last night and laughed at how many lights we had turned on for the party. Back to mudding and taping the new bathroom walls. Then it's onto canning the strawberry jam and canning the turkey leftovers from last night. No rest going into the New Year. Glad everyone is okay. "Block Party" for cold neighbors......sounds like you'd be popular! Pulled out the rest of the dining room carpet and MrWE2 removed all the staples. Started clearing out the livingroom (it's got odd's and end's from our canning/labeling session. We're moving it all into the bedroom for the time being. I think we got all the pantry foods moved into the extended pantry and did some organizing there also. Tomorrow we'll probably just hang out here at home since we're going to the Moose Lodge for New Year's Eve. They always have a great band and it's really nice to be with our friends there and dance our sock? off! LOL Got a bit of snow last night, but not enough to really be concerned about. Got up this morning and we both enjoyed draping ourselves in the new fleece pancho's I crocheted while I drank my coffee (got some special coffee from a friend and am enjoying it!) and MrWE2 drank his Swiss Miss :-) Abby was sleeping in her new fleece with her blanky on her mommy's side of the bed, and was a bit "wacha want!" when MrWE snapped her pic...wanna see? Awww. Sweet Abby Girl is as beautiful as ever! Today I began to play the 15 puzzle. Anyone remember these from decades before computer games? The 15-puzzle (also called Gem Puzzle, Boss Puzzle, Game of Fifteen, Mystic Square and many others) is a sliding puzzle that consists of a frame of numbered square tiles in random order with one tile missing. The puzzle also exists in other sizes, particularly the smaller 8-puzzle. If the size is 3×3 tiles, the puzzle is called the 8-puzzle or 9-puzzle, and if 4×4 tiles, the puzzle is called the 15-puzzle or 16-puzzle named, respectively, for the number of tiles and the number of spaces. The object of the puzzle is to place the tiles in order (see diagram) by making sliding moves that use the empty space. HOWEVER....mine is real life size. Instead of having small tiles with numbers....I have a kitchen and living room [and maybe porch] in my game. I slide a piece here and then must move this one and that one to let the "tile" I want to slide thru. Translation: moved a bunch of boxes [which would be on the porch but I'm afraid of snow] then moved other small furniture, then moved totes, then moved small stuff off of the coffee table I want to be parallel to east wall instead of perpendicular to it. Had to get dehydrator, 'Sherman' the pressure canner, and multiple other things off before I could even SLIDE it over. Kept moving other pieces of my 'puzzle' until the heavy-even-when-empty coffee table would fit close to where it should end up. Then had to move all that and more out of the way [any ole where temporarily] to remake a path thru living room till I'm ready to make my next set of moves. I have to sit and think out HOW to do the next maneuver....what moves first to get the 'tile' I want ....where I want it. Translation: Need the couch moved [first time in a couple decades] to east wall from the north wall......with coffee table in front of it....eventually. But as with this sliding puzzle hand game, it will take a lot of other 'pieces' moving in the correct order before that can happen. I've sometimes questioned that in my "tiny house puzzle" ...or it's partner downstairs...the "never-ending-basement/garage puzzle" Who am I to argue MATH with Johnson and Story??? MtRider .....best way I know how to describe this process of changing ANYTHING in a teeny, tiny house! I never could work those puzzles. I've had some with numbers and some with a picture to complete. I just can't do them without cheating. Cheating? Yeah, I would carefully remove one of the tiles. Bwaaa-ha-ha. I can't even work them online where you can hit the reset button. Maybe you could remove a piece out of the equation? Or wait until the spring thaw and stuff the porch full. We're all battling bronchitis or flu in my home...laying around in pj's today taking it easy. Ack! Had a tooth go ballistic on me during Christmas, dentist took it out 2 days ago. I'm having trouble talking and eating. 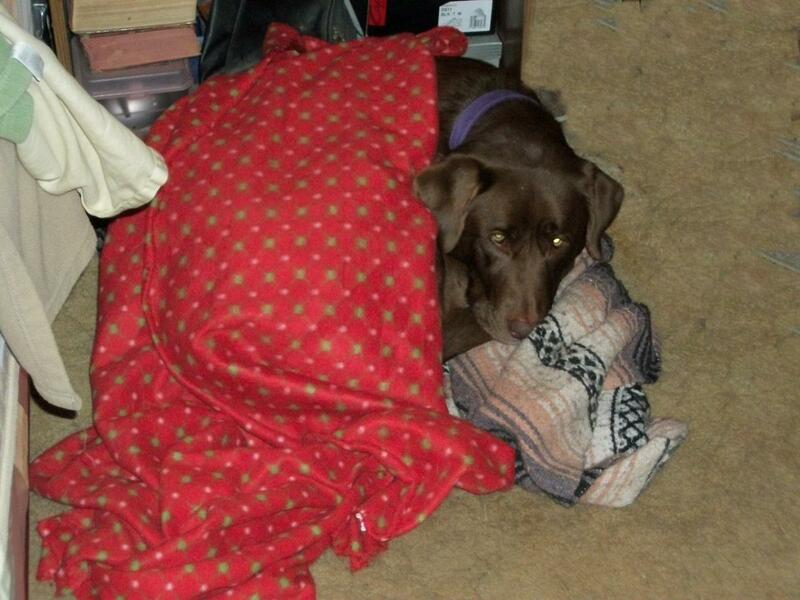 (((((dogmom4))))) Then, to add insult to injury, DH has a bad case of the flu/cold or what ever it is. I'm hoping not to get it, God willing. Started some jalapeño, cayenne, and thyme in cups in the house, until the weather warms up at night. Lately, it's been 28-30 degrees at night and frosty in the mornings. We're not going anywhere or doing anything tonight. Ugh. It's time for me to get back at it. Today was "go pay taxes" day....but they're paid for another year. That's part of owning properties. Also picked up a pizza to drop off to a very dear friend who has had some serious health issues and is spending New Year's alone :-( We'd take her with us if she was up to it, but she's not. At least she knows I love her. Also picked up a pizza for us to have before we go to the Moose Lodge. Just stopping by MrsS to say Happy New to all and a safe enjoyable beginning 2016. Taped and mudded most of the day in the new bathroom. Also cooked a turkey carcass and will end up with a few pints of turkey and about 5 qts of broth. Made the house smell heavenly while working in the bathroom. Will process it tomorrow. Tonight was steak on the grill. It's a tradition that DH had when living at home 50 years ago. My kind of tradition!! Was pretty shocked at steak prices though. Had been a year since the last purchase. LOL Homesteader, I was bowled over when I saw the price of a standing rib roast - what my DH's family BBQ's for Christmas. Wow! 9.89 lb.?!!!!!! Cool game, Mt_Rider. I used to spend hours and hours, determined to figure it out, and I did sometimes. Sorry to hear of those of you in dental pain.....or sick. Not a nice way to ring in the new year. DH grabbed a pizza yesterday after running around for hours on his "day off" . Got lots done and more done today. My PUZZLE GAME in my living room went well today. DH was home and helped move the couch and the heavy coffee table twice. Jeepers. I REALLY DID do a cheat on my "puzzle" too. [and I remember how to lift those plastic pieces out...lol ]. From 1-3 pm today, we had sunny weather tho only 20 degrees. No wind. I hauled and hauled stuff out to porch to sit and wait. Once we got the two major pieces moved.........AND FILLED HORSE TANK AGAIN......I had to get the rest of the stuff fitted inside again. By 4pm the temperature had DROPPED to about 10 degrees....and fell out rapidly after that. I kept hauling stuff in and fitting it. DH went out to feed. I make soup/grilled cheese as an option besides pizza we'd been munching on since last nite. It was good to have DH to assist. He was doing a lot of bookwork but came to help with the major stuff and the horse tank. Yet...we both feel like we've been run thru the wringer. The groaning started about half way thru the afternoon. I've already taken Nuprin. By 3pm when the day was waning......so was I. I'd bring a box in...then lay on couch. Get up and move something....then lay on couch. This reallllllly drags me under. But.....while I can't claim it looks better....yet. I can say even DH can now see what I'm aiming for and where the potential is. If I wasn't packing up so much stuff to get rid of....before we move someday...????? .....there wouldn't be so much chaos. That ole thing: It's gonna get worse before it gets better. Having a bad back the last couple of days so I'm just chillaxing today. I ran a couple of quick errands earlier and came home to my jammies and am using the old heating pad the rest of the evening. I was thinking about going to Wal-Mart this evening but no way am I going out there on 'amateur night'. I don't want anything that bad. DH gave me the crud, it took over my head last night like hitting a brick wall. Today, I hope to get the house cleaning done. Trying to start the new year off right. I don't know how far I'll get, but I am certainly going to try to complete it. Last night we went to a neighbor's surprise 70th BD party/News Year's Eve party. DD1 and DSIL came last night for the weekend. We came home about 9:30 pm and they were here. We are planning to have our Christmas this weekend. We have a funeral to attend Saturday afternoon, then will open gifts Saturday night and have our big dinner on Sunday. Then Dd & DSIL will go home Sunday evening. It's only a 3 1/2 hr trip for them. We have some cleaning, lots of cooking and some gift wrapping to do today. I hope everyone is successful in whatever projects you are doing this week! It doesn't sound like any of us are off to a roaring start for 2016! I am sitting in a chilly house. The gas company turned off our gas Wednesday afternoon because they say we have a leak. So far, we have been unable to get anyone out here. Between it being a holiday and alot of other folks having to have repairs due to our record Christmas Day flood we are stuck. It isn't something DH can do..it has to a licensed company and inspected by the gas company. Of course, the gas company won't work again until Monday. We have gas heat, stove and hot water. It is at least fortunate that we have no little ones or company around. When I go back to work on Monday I will have about a 20 mile detour (one way) due to a washed out road from the 10 inches of rain we got last week. My poor sister is finally out of her coma but is unresponsive. Her ex DH will have to make a decision on Monday or Tuesday about whether to "turn off" the equipment or have feeding tube etc. installed. Even though he is her ex they have been living together and he does love her, so I know he will decide what is right for her. I am giving him all the moral support I can. DH is having gut pains and isn't hungry, which usually means his diverticulitis is acting up. Often this means a trip to the hospital and massive antibiotics. On the plus side, we are alive and breathing on our own and ALABAMA won last night so there is hope. LOL. Happy New Year to ya'll. Wow....things are really tough at your house/neighborhood, Momo.